It’s appropriate that we hear Fences before we see it. The voices of Troy (Denzel Washington) and Bono (Stephen Henderson) emerge over a black screen before the two actors come into focus, and this verbal torrent never lets up. Troy is a great talker, holding court in his backyard, where much of the film takes place, and putting on an extravagant show for his loyal pal with his anecdotes, jokes and commentary. But he’s also a man filled with anger and frustration; a black man in Pittsburgh in the 1950s who could have made it as a baseball player in a later era, but instead finds himself working on a garbage truck, which they won't even allow him to drive. He uses his words to keep control of those in his home – his wife Rose (Viola Davis) and his son Cory (Jovan Adepo) – both of whom have seen their own hopes and dreams dashed by being yoked to this domineering man. Watching Washington’s performance here, I was reminded of Daniel Plainview, another man driven by the need to exert an iron grip over all those in his vicinity, and it’s a testament to Viola Davis that Rose isn’t overwhelmed by the force of this performance; in fact, over the course of the film she becomes an even more compelling figure, her long-suppressed emotions exploding at Troy in scene that is breathtaking in its emotional force. 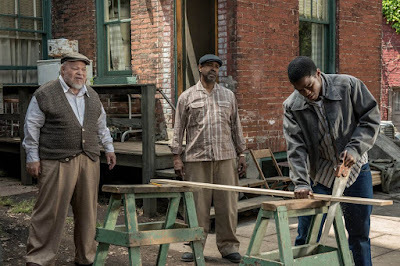 All of these actors (with the exception of Adepo) are reprising the roles they took in a 2010 production of August Wilson’s Pulitzer-winning play, and while it must have been an electric thrill to watch them on stage, this film adaptation often feels like a slightly more awkward fit. It’s such a dialogue and character-driven piece, we’re never allowed to forget that we are watching something with its origins in the theatre. The Maxsons’ back yard feels more like a theatrical backdrop than a real, lived-in space, and Washington doesn’t do much to try and open up the picture aside from a few negligible cutaways to other locations. And yet, as a cinema experience, I found it largely absorbing. Wilson’s writing is so sharp, lyrical and thematically and culturally rich, it deserves to be brought to a wider audience. That is what Denzel Washington has attempted to do with this faithful adaptation, and even if it might give off the stale whiff of 'filmed theatre', I found it too riveting, powerful and impressive to dismiss as a cinema experience. Ben Affleck’s best film as a director remains his debut – 2007’s Gone Baby Gone, adapted from the novel by Dennis Lehane – and his return to Lehane’s work for his fourth feature continues the gradual but inexorable decline in his filmmaking. Is it any coincidence that his best film is also the one in which he doesn’t take the lead role? 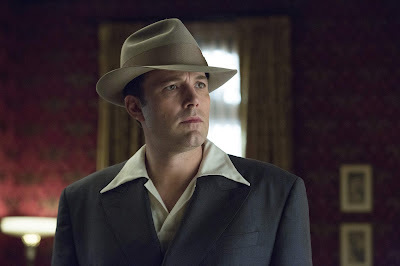 In Live by Night, Affleck gives a lumpen and charisma-free performance as Joe Coughlin, a veteran of the Great War who returns to Boston in the 1920s determined to live as an outlaw, and refusing to swear fealty to either the Irish or Italian mobs that control the town. We get much of this background detail in Affleck’s somnolent voiceover, which is liberally used throughout to tie up a film that seems to have lost a lot of connective tissue in the editing process, and the tone of Affleck’s delivery (I guess he’s aiming for gravitas) sets a dour mood that Live by Night can never shake off. Live by Night has all of the period trappings but no soul; nothing feels lived-in, nothing feels real. With a lot of plot to get through and no time to develop atmosphere or characters, Affleck just keeps shunting us from one incident to the next, with the film’s narrative and its moral compass growing more confused with every step. Individual scenes show signs of life. The car chases and shootouts are well-handled, and Affleck’s knack of casting smaller roles pays off with some colourful supporting turns; notably Chris Messina as Joe’s right-hand man, Matthew Maher as a Klansman muscling in on his turf, and particularly Sienna Miller as an Irish gangster’s moll who lights up the film’s first half. (After this film and Burnt, Miller is making an unfortunate habit of doing great work in misbegotten vanity projects.) Miller’s character is short-changed by the script, though, as are Elle Fanning and Zoe Saldana, with the film’s cruel final twist ensuring that this thoroughly mediocre effort leaves a sour aftertaste. Joseph Losey made his directorial debut with this bizarre anti-war parable disguised as a whimsical family film. Opening with the startling sight of young Peter (Dean Stockwell, baby-faced here, though already an experienced screen actor by this point) with a completely shaven head, the film recounts Peter's sad story through flashbacks as he shares it with Dr. Evans (an underused Robert Ryan). Orphaned during the war, Peter found himself being despatched from one foster home to another until he ends up with Gramps (Pat O'Brien), a blarney-spouting, shillelagh-waving entertainer who dotes on the boy. 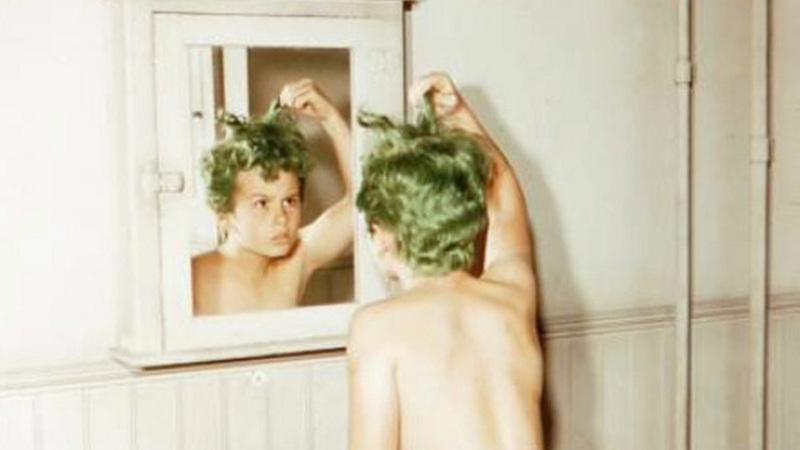 However, his happiness is disrupted by his hair inexplicably turning green one night, although we suspect it might have something to do with the stress of the ongoing war. In a beautifully constructed scene, Peter's anxiety grows as he overhears adults chattering about the conflict until it causes him to shatter a milk bottle; the adults chuckle over him, oblivious to his inner turmoil. This inner pain becomes external when his hair transforms, and Peter is made an outcast, his unnatural locks marking him as something 'other' to be viewed with suspicion and fear by the residents of this small American town. The Boy with Green Hair takes on an extra resonance when you consider Losey's experiences in the years to come, when he was blacklisted by HUAC and forced to continue his career in Europe, but aside from that thematic link, this feels like a strange outlier in his career. A bold attempt to deliver a postwar plea for peace in a fable aimed at younger audiences, the film blends some striking fantasy sequences – including one in which Peter is addressed by the war orphans his school has been raising money for – and some heavy-handed writing, and overall it possesses a curious power. Certainly, the scene in which Gramps acquiesces to pressure from the townsfolk and takes young Peter to have his head shaved is a depiction of betrayal that feels surprisingly raw and pointed. The film rather limps to the requisite happy ending after that impactful moment, which dulls the film's impact, but this is a fascinating curio nonetheless. 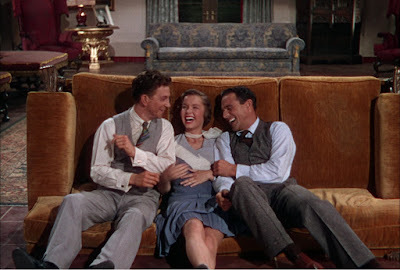 Every time I watch Singin’ in the Rain I hope to enjoy the Broadway Melody a little more. There’s no particular reason why I shouldn’t love this sequence as much as everything else in the picture – it’s staged and choreographed with just as much skill, and Cyd Charisse is there vamping up a storm – but it just feels so out of place. It stalls the film’s momentum at a crucial moment, particularly coming hot on the heels of the Good Morning and Singin’ in the Rain numbers, and it feels like it has been imposed on the film (indeed, it was a late addition at the behest of Arthur Freed) rather than serving the narrative or growing organically out of the characters and their situation. I always find my attention wandering during the whole “Gotta Dance!” business, and wishing we were spending more time with Donald O’Connor and Debbie Reynolds instead. In fairness, this sequence does end with a great gag, when it cuts back from this reverie to Kelly describing his vision to studio head R.F. Simpson (Millard Mitchell), who responds with, "I can't quite visualise it.” Aside from that one particular sequence, what’s not to like? Singin’ in the Rain remains one of the most purely joyous experiences in cinema. That joy explodes from the screen in some of the most perfectly realised musical sequences ever crafted; Kelly, O’Connor and Reynolds move in perfect harmony, their dancing both graceful and witty, and sometimes – as in O’Connor’s acrobatic Make ‘em Laugh number – just confounding in its brilliance. Re-watching it this week, I’d forgotten how consistently funny it is, the playful exploration of cinema’s glamorous façade and the more complicated reality being set up with Kelly’s “Dignity…always dignity,” and the difficulties inherent in cinema’s transition from the silent era to sound being the basis for some priceless moments. In particular, the scene in which a microphone is positioned in various place on or around the screeching Lina (Jean Hagen) is a hoot, escalating brilliantly from humiliation to slapstick. Recent screenings of Singin’ in the Rain have all been from DCP so this opportunity to revisit the film on 35mm was a rare treat, and, aside from some rough reel changes, the print was a beauty, alive with dazzling, vivid colours. What a glorious feeling, indeed.